The Red-legged Partridge (Alectoris rufa) is also known as French Partridge to distinguish it from the Grey or English Partridge. 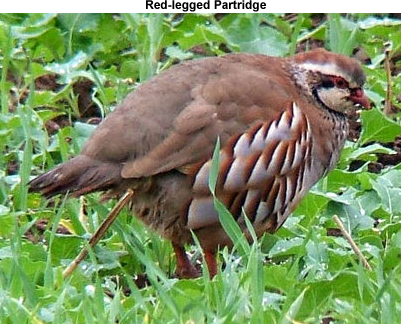 This partridge breeds naturally in south western Europe, in France and Iberia. It has become naturalised in southern England, where it was introduced as a game species. It is replaced in south eastern Europe by the very similar Rock Partridge (Alectoris graeca). It is a non-migratory terrestrial species, which forms flocks outside the breeding season. The call is a three-syllabled ka-chu-chu.